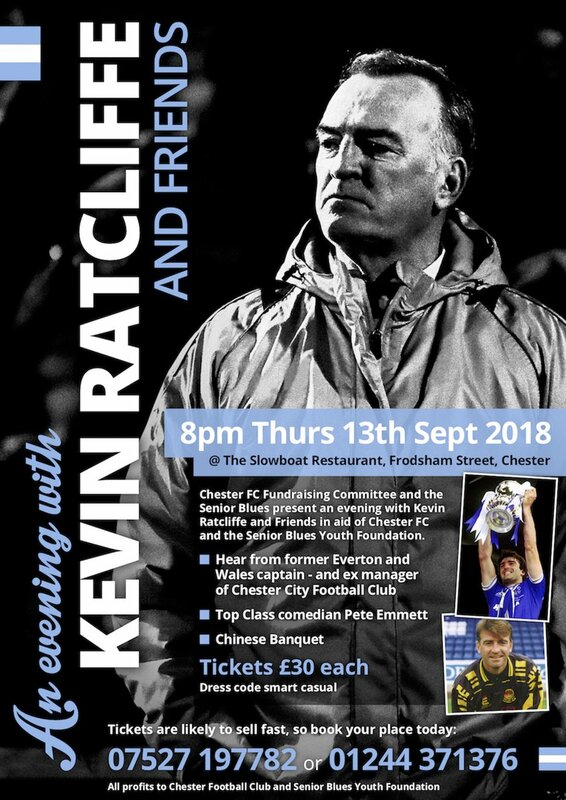 Chester Football Club – Official Website » FUNDRAISING | An evening with Kevin Ratcliffe and friends! The evening, taking place at the Slowboat Restaurant in Frodsham Street (CH1 3JJ) is raising funds for Chester FC and the Senior Blues Youth Foundation. Former Everton and Wales Captain – and Chester Manager – Kevin Ratcliffe will be giving a talk, and it will be hosted by Comedian Pete Emmett. Call 01244 371376 or 07527197782 for tickets. It is £30 per person and also features a Chinese Banquet. Dress code is smart casual. The event begins at 8pm on the night.